CS-Cart includes the Store Locator add-on by default. This add-on allows to add a “Find our store” block with a Search field in the storefront. Customer can enter a city or country in the search field and see the store closest to him on the map. 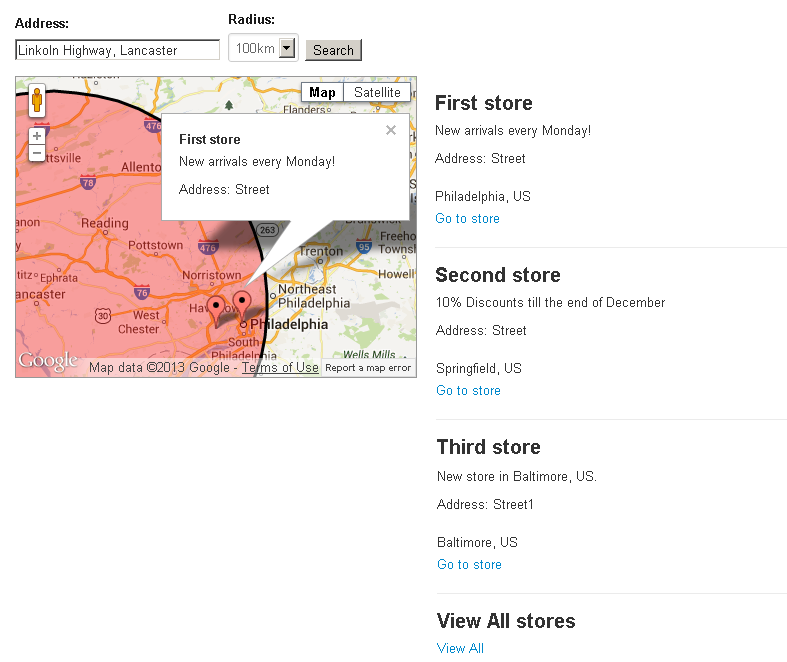 Our new Store locator modification is another representation of a Store locator functionality. (for example, a customer can input his Address and a Radius to search for the nearest stores). This modification works when the default Store locator add-on is enabled. The initial price for this modification was $360. Now we are ready to implement it for CS-Cart 3.0.x, 4.0.x versions for $220. Please, have a look at a live website here http://urssurbeck.ch/en/find-pointofsale-surbeck-basenkonzentrat (notice, the design is custom, not default). This modification was written according to the exact technical specification and there are no settings for disabling All stores link and choosing miles instead of km. From the radius selectbox customers can choose the following search radius 25, 50, 75, 100 km. It all can be easily changed as you require for a little extra charge (appr. $50)." "I am interested in purchasing your store locator, however I would like to know if you have a demo of the store locator including the admin side? If you don't have a demo can you direct me to a website that is currently using your store locator so I can see the website display functionality? Would also like to know if the view all stores link can be disabled or removed and if the search radius can be changed from Kilometers to Miles and be limited to a specific amount of miles in the admin?